“I used to beat on queers.” My dad’s words were pulled from his throat like a prime bass on a fishing line. We watched it, muted, as it fought for air at our feet. My girlfriend’s hands were clammy with nervousness and July. My family’s hands were blissfully unaware, a few yards away, dancing breezily on the patio, lazily choking the heads of beer bottles, drunk with barbeque. 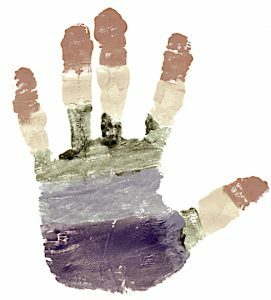 My dad’s hands were across from us, folded calmly, faintly rainbow with past blood. He taught me how to tie my shoes, how to attach “ma’am: and “sir” to the ends of my sentences. Before I grew front teeth, he taught me not to stick my hands on the stove. I did anyway, I got burned, I should have listened, he “told me so.” I developed a subtle but unwavering faith in him; after all, he had lived forever. Somewhere, in the pits of my eager subconscious, this faith grew muscles. I learned to trust authority figures like I learned to trust my dad. They told me so, and so I listened, and so I avoided being burned. Teachers, government officials, policy makers, and religious leaders were to be trusted. It was for my own good. I only notice this faith now that it is gone. I am sure I owe it to that Fourth of July. I was ten years old, stumbling out of the closet with no moral compass of my own. When I approached the light my eyes were dazzled; blinded by a naive heart, I paraded Justine around to my family like the first light bulb. Eureka! They all thought we would be better off as friends. In a time warp, before my dad grew teeth, he might have assumed that we would be better off as stains on his knuckles. With barbecue sauce still on our shirts, he sat us down and confessed how disgustingly unnatural we were. It was for my own good. He still bought me a birthday present that year. The “I love you’s” still flowed, unchanged. However, the waters flowed on too, and I have not stepped in the same river since. On that day, a dangerously rebellious question began to sprout on my psyche: “but…why?” Why was person-plus-person love so offensive? Why was everyone offended but me? Who was wrong? Nothing felt wrong. Nothing felt wrong, except him feeling like we were wrong. What else was he wrong about? His opinions on same-gender relationships clashed violently with mine; my sudden doubts about his morality knocked me out cold. The newfound skepticism tasted like fresh blood. If I continued to let my dad’s lessons mold me, unfiltered by own reasoning, I would be left with an inherited and impersonal rulebook for living. The conflict on Independence Day became a catalyst for my own independence, an acquaintance with truth. I was to counteract, to question, all that I accepted blindly from authority figures. It was for my own good.